In a paper just released, “Insights into the origin of rare haplogroup C3* Y chromosomes in South America from high-density autosomal SNP genotyping,” by Mezzavilla et al, research shows that haplogroup C3* (M217, P44, Z1453), previously believed to be exclusively East Asian, is indeed, Native American. The discovery of C3* as Native is great news, as it more fully defines the indigenous American Y chromosome landscape. It also is encouraging in that several mitochondrial haplogroups, including variants of M, have also been found in Central and South America, also not previously found in North America and also only previously found in Asia, Polynesia and even as far away as Madagascar. They too had to come from someplace and desperately need additional research of this type. There is a great deal that we don’t know today that remains to be discovered. As in the past, what is thought to be fact doesn’t always hold water under the weight of new discoveries – so it’s never wise to drive a stake too far in the ground in the emerging world of genetics. It’s likely to get moved! You can view the Y DNA projects for C-M217 here, C-P39 here, and the main C project here. Please note that on the latest version of the ISOGG tree, M217, P44 and Z1453 are now listed as C2, not C3. Also note that I added the SNP names in this article. The Mezzavilla paper references the earlier C3 type naming convention which I have used in discussing their article to avoid confusion. In the Messavilla study, fourteen individuals from the Kichwa and Waorani populations of South America were discovered to carry haplogroup C3*. Most of the individuals within these populations carry variants of expected haplogroup Q, with the balance of 26% of the Kichwa samples and 7.5% of the Waorani samples carrying C3*. MRCA estimates between the groups are estimated to be between 5.0-6.2 KYA, or years before present. Other than one C3* individual in Alaska, C3* is unknown in the rest of the Native world including all of North American and the balance of Central and South America, but is common and widespread in East Asia. We set out to test whether or not the haplogroup C3* Y chromosomes found at a mean frequency of 17% in two Ecuadorian populations could have been introduced by migration from East Asia, where this haplogroup is common. We considered recent admixture in the last few generations and, based on an archaeological link between the middle Jōmon culture in Japan and the Valdivia culture in Ecuador, a specific example of ancient admixture between Japan and Ecuador 6 Kya. In a paper, written by Estrada et all, titled “Possible Transpacific Contact on the Cost of Ecuador”, Estrada states that the earliest pottery-producing culture on the coast of Ecuador, the Valdivia culture, shows many striking similarities in decoration and vessel shape to pottery of eastern Asia. In Japan, resemblances are closest to the Middle Jomon period. Both early Valdivia and Middle Jomon are dated between 2000 and 3000 B.C. A transpacific contact from Asia to Ecuador during this time is postulated. This of course, opens the door for Asian haplogroups not found elsewhere to be found in Ecuador. The consensus view of the peopling of the Americas, incorporating archaeological, linguistic and genetic evidence, proposes colonization by a small founder population from Northeast Asia via Beringia 15–20 Kya (thousand years ago), followed by one or two additional migrations also via Alaska, contributing only to the gene pools of North Americans, and little subsequent migration into the Americas south of the Arctic Circle before the voyages from Europe initiated by Columbus in 1492. In the most detailed genetic analysis thus far, for example, Reich and colleagues identified three sources of Native American ancestry: a ‘First American’ stream contributing to all Native populations, a second stream contributing only to Eskimo-Aleut-speaking Arctic populations, and a third stream contributing only to a Na-Dene-speaking North American population. Nevertheless, there is strong evidence for additional long-distance contacts between the Americas and other continents between these initial migrations and 1492. Norse explorers reached North America around 1000 CE and established a short-lived colony, documented in the Vinland Sagas and supported by archaeological excavations. The sweet potato (Ipomoea batatas) was domesticated in South America (probably Peru), but combined genetic and historical analyses demonstrate that it was transported from South America to Polynesia before 1000–1100 CE. Some inhabitants of Easter Island (Rapa Nui) carry HLA alleles characteristic of South America, most readily explained by gene flow after the colonization of the island around 1200 CE but before European contact in 1722. In Brazil, two nineteenth-century Botocudo skulls carrying the mtDNA Polynesian motif have been reported, and a Pre-Columbian date for entry of this motif into the Americas discussed, although a more recent date was considered more likely. Thus South America was in two-way contact with other continental regions in prehistoric times, but there is currently no unequivocal evidence for outside gene flow into South America between the initial colonization by the ‘First American’ stream and European contact. The researchers originally felt that the drift concept, which means that the line was simply lost to time in other American locations outside of Ecuador, was not likely because the populations of North and Central America have in general experienced less drift and retained more diversity than those in South America. The colonization of Americas is thought to have occurred 15–20 thousand years ago (Kya), with little or no subsequent migration into South America until the European expansions beginning 0.5 Kya. Recently, however, haplogroup C3* Y chromosomes were discovered in two nearby Native American populations from Ecuador. Since this haplogroup is otherwise nearly absent from the Americas but is common in East Asia, and an archaeological link between Ecuador and Japan is known from 6 Kya, an additional migration 6 Kya was suggested. 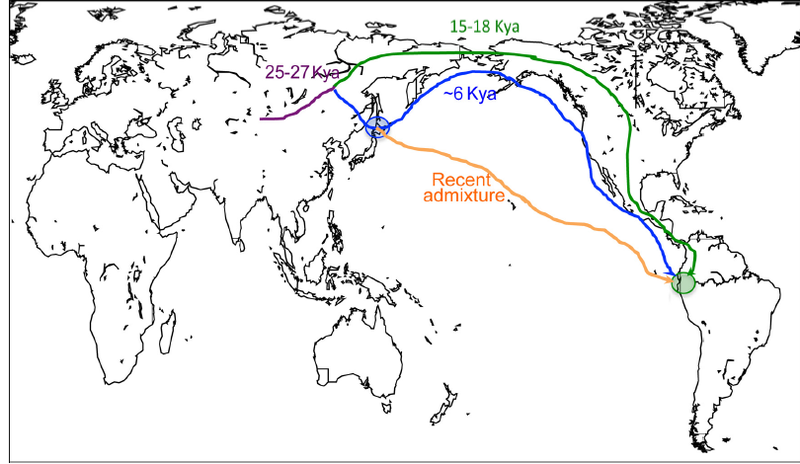 Here, we have generated high-density autosomal SNP genotypes from the Ecuadorian populations and compared them with genotypes from East Asia and elsewhere to evaluate three hypotheses: a recent migration from Japan, a single pulse of migration from Japan 6 Kya, and no migration after the First Americans. First, using forward-time simulations and an appropriate demographic model, we investigated our power to detect both ancient and recent gene flow at different levels. Second, we analyzed 207,321 single nucleotide polymorphisms from 16 Ecuadorian individuals, comparing them with populations from the HGDP panel using descriptive and formal tests for admixture. Our simulations revealed good power to detect recent admixture, and that ≥5% admixture 6 Kya ago could be detected. However, in the experimental data we saw no evidence of gene flow from Japan to Ecuador. In summary, we can exclude recent migration and probably admixture 6 Kya as the source of the C3* Y chromosomes in Ecuador, and thus suggest that they represent a rare founding lineage lost by drift elsewhere. This graphic from the paper, shows the three hypothesis that were being tested, with recent admixture being ruled out entirely, and admixture 6000 years ago most likely being ruled out as well by utilizing autosomal DNA. Three different hypotheses to explain the presence of C3* Y chromosomes in Ecuador but not elsewhere in the Americas were tested: recent admixture, ancient admixture ∼6 Kya, or entry as a founder haplogroup 15–20 Kya with subsequent loss by drift elsewhere. We can convincingly exclude the recent admixture model, and find no support for the ancient admixture scenario, although cannot completely exclude it. Overall, our analyses support the hypothesis that C3* Y chromosomes were present in the “First American” ancestral population, and have been lost by drift from most modern populations except the Ecuadorians. It will be interesting as additional people are tested and more ancient DNA is discovered and processed to see what other haplogroups will be found in Native people and remains that were previously thought to be exclusively Asian, or perhaps even African or European. This discovery also begs a different sort of question that will eventually need to be answered. Clearly, we classify the descendants of people who arrived with the original Beringian and subsequent wave migrants as Native American, Indigenous American or First Nations. However, how would we classify these individuals if they had arrived 6000 years ago, or 2000 years ago – still before Columbus or significant European or African admixture – but not with the first wave of Asian founders? If found today in South Americans, could they be taken as evidence of Native American heritage? Clearly, in this context, yes – as opposed to African or European. Would they still be considered only Asian or both Asian and Native American in certain contexts – as is now the case for haplogroup C3* (M217)? This scenario could easily and probably will happen with other haplogroups as well. This entry was posted in DNA, South America. Bookmark the permalink.